All you need are five simple ingredients for this nourishing, vegetarian soup. Butternut squash, chopped onion and mellow fennel bulb are slowly simmered with a little thyme and vegetable broth, then pureed. It's a comforting dish that's perfect for cold fall and winter nights and also happens to be very good for you—it's Whole 30 and paleo friendly, and butternut squash is packed with vitamins and potassium. It is delicious on its own, or topped with tangy crumbled goat cheese or homemade croutons. Sprinkle with some crushed red pepper flakes or drizzle with chile oil for a kick. There are a wide variety of fall or winter squashes you can use in place of butternut. Kabocha, acorn, red kuri, or buttercup squash can all be used as a substitute. If using a squash with skin that is hard to remove, you can roast the squash with the fennel in a 350°F oven until fork-tender, 40 to 45 minutes. Then you can easily scoop the squash out of the skin and puree it. This requires a longer cooking time, but otherwise works just as well with this recipe. Per Serving: 114 calories; 3g fat; 23.5g carbohydrates; 3g protein; 0mg cholesterol; 564mg sodium. I like to make a huge batch of soup and then freeze it to use throughout the course of a few weeks. I really liked the flavor of this one. The fennel brought in that slight licorice flavor that worked very well with the butternut squash. Nice healthy comforting soup for Fall. Super easy to make, but pretty bland. As a vegan, I can't add the "tangy" goat cheese as a topping, although it sounds delicious... I would suggest adding salt/pepper to the mixture instead of seasoning. Kabocha worked perfectly as a substitute in this recipe. I didn't add goat cheese or anything, just some garlicky croutons. Yum! This soup paired perfectly with my mom's homemade cornbread. I especially love the creamy goat cheese topping. It adds a nice element I would get from my butternut squash bisque, where I add cream. 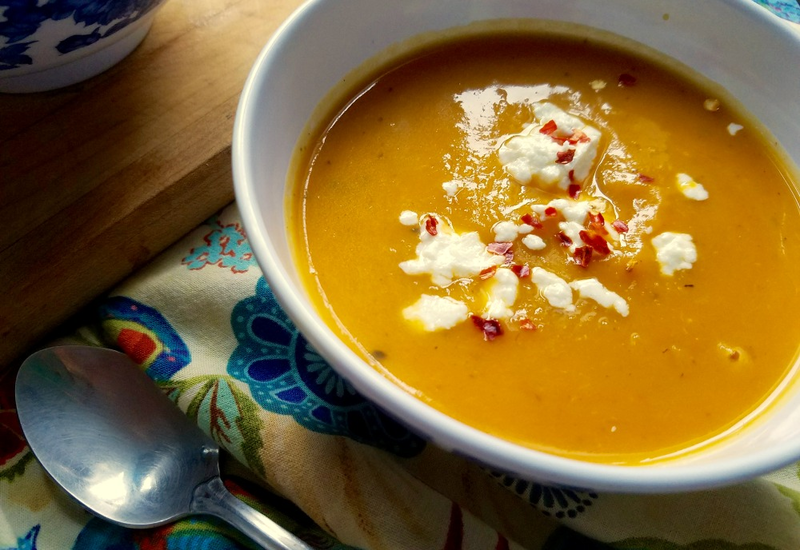 Kabocha squash was the perfect substitute for butternut in this soup. I'm not a huge fan of the fennel taste so I used onion, thyme, and added garlic. I really liked the soup, it's really quick and easy to prepare as well.